Managed futures funds suffered category-wide losses of 1.82% in October, reversing course after posting gains of 1.21% the prior month. There were still standout performers within the category, though, as the top three managed futures funds notched monthly gains ranging from 1.20% to 2.53%. The category's bottom three performers, meanwhile, averaged losses of 4.70% - indicating a wide dispersion of returns between the best- and worst-performing funds. The Dunham Alternative Strategy Fund was the month's best-performing fund, posting gains of 2.53%. The fund, which debuted in 2009 and recently had $23.4 million in assets under management ("AUM"), had five-year annualized returns of -0.36% for the period ending on October 31. Its one-year returns through that date was positive at +0.29% but still well under the category average of +5.24%. DAASX did significantly outperform its peers over the three months ending on Halloween, though, as it gained 0.04% compared to the category's losses of 2.56%. It appears that the fund may be gaining steam. The Superfund Managed Futures Strategy Fund and the Grant Park Managed Futures Strategy Fund were the number-two and -three best-performing managed futures mutual funds in October, posting respective gains of 1.28% and 1.20%. It was something of a bounce-back month for both funds, which had each underperformed over the 12 months ending October 31: SUPIX ranked in the bottom three of September's performers and lost 5.95% for the year ending Halloween, while GPFIX's gains of 3.87% still trailed the category average of +5.24%. The funds had respective AUM of $4.9 million and $51.8 million, and were originally launched in 2013 and 2011, respectively. The AQR Managed Futures Strategy HV Fund was at the very bottom of the category, with its shares falling 4.93% for the month. Shareholders are likely able to take those losses in stride, though, since the fund gained an impressive 21.54% for the year ending October 31, ranking at the very top of the managed futures category. QMHIX originally launched in 2013, and its AUM recently stood at $505.9 million. The month's other worst performers were also outperformers over longer periods: The Arrow Managed Futures Strategy Fund, which posted a 4.61% loss in October, had one-year gains of 7.89% for the year ending October 31; and the American Beacon AHL Managed Futures Strategy Fund, which was the month's third-worst performer with losses of 4.56%, had one-year gains of 9.08%. Of the two funds, MFTNX is older but smaller, with its original launch in 2010 and AUM of $29.6 million, compared to AHLIX's 2014 debut and $100.8 million in AUM. There were no repeat winners or losers in the top or bottom three from September to October. 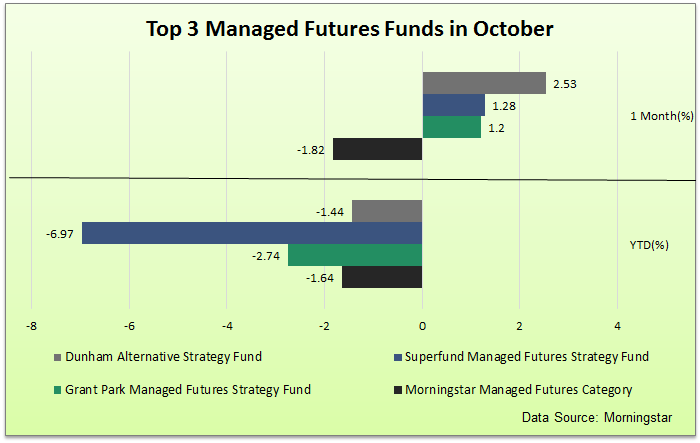 Indeed, all three of September's top performers posted losses in October, and two of September's three worst managed futures funds notched gains - one of September's worst, the Superfund Managed Futures Strategy Fund, jumped into October's top three. The Altegris Futures Evolution Strategy Fund (MUTF:EVOIX), the 361 Global Counter-Trend Fund (MUTF:AGFZX), and the LoCorr Managed Futures Strategy Fund (MUTF:LFMIX) - which posted respective gains of 5.30%, 4.40%, and 3.78% in September - saw their shares fall by 2.56%, 1.34%, and 2.39% in October. Meanwhile, the Superfund Managed Futures Strategy Fund (SUPIX) and the Discretionary Managed Futures Strategy Fund (MUTF:FUTEX) - the second- and third-worst performing funds in September, with respective losses of 1.58% and 0.77% - bounced back with respective gains of 1.28% and 0.19% in October. 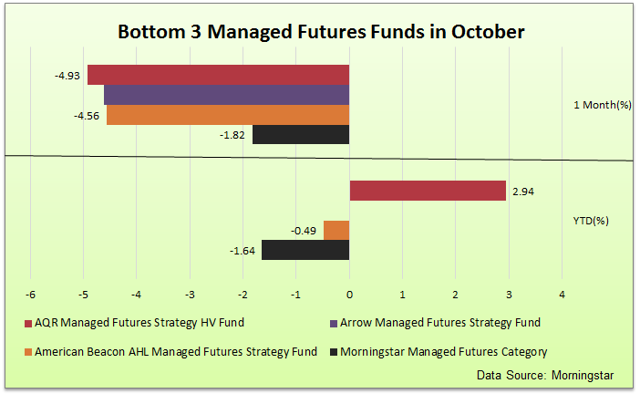 Remember: The category average for October was -1.82%, and with that in mind, even September's worst performer - the 361 Managed Futures Strategy Fund (MUTF:AMFZX), which lost 4.81% in September - outperformed the average, as it only lost 1.74% in October.